I made a decision a month or so back to boycott the London Olympics. So I didn’t apply for accreditation, though it could have saved me some money doing the normal things I do, as I would have got a decent amount of free travel around London thrown in. Though perhaps it wouldn’t have been fair to use it since many of the things I was likely to cover are protests around the event. Financially it probably wasn’t a good decision as there has been a virtual media blackout on anything that might suggest not every Londoner loves the games, but then far too many photographers are covering the games for those without big agency connections to get much from them. I don’t have much interest in watching sport, though I got a medal for football when I was 11 and later used to enjoy playing rugby. I was even a half-decent middle distance runner in my time, holding a few local records, and had I given up smoking and done some training might have gone further. I still enjoy cycling (despite recent painful experiences from which I’m still suffering.) But watching other people compete has never greatly interested me. When I see spectators at events or in front of their TV I always feel they should get off their backsides and go and do something. Far better to do it badly yourself than watch. When I came of age I did give up smoking, but never took seriously to sport, though I was playing football and rugby regularly as a student it was more a social event than anything sporting, something you did with your mates before going to the bar which was the real point of the thing. 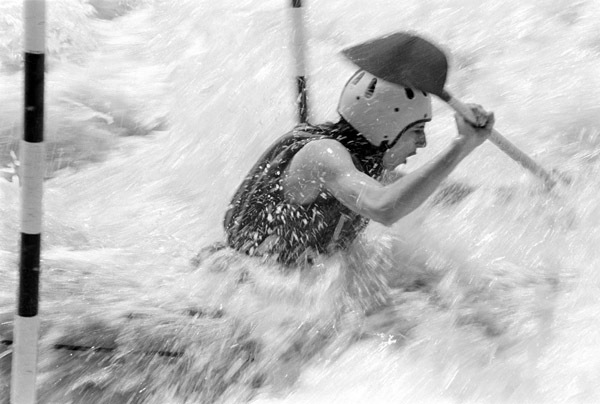 When I started in photography, like most people I didn’t know what to photograph, and in the amateur magazines I read at the time, sport was one of the major subjects, and I had a go at it. Some of my earliest published pictures were sports photos, and I won a couple of magazine prizes with them, but I didn’t really find making them of great interest. I had a problem even finding those images now, though certainly back in the early days I kept every tear-sheet, and I’ve got rid of very few negatives. Probably somewhere at the bottom of a large pile I’ve even got the 20×16 exhibition print I remember making of one of them. But then I remembered I’d used them in a post here a couple of years ago. These were the first successful sporting pictures I took, and I soon gave up. Both were taken at the same event, shortly after I’d bought an Olympus OM1 camera (A truly revolutionary redesign of the SLR that had just come out) and something pretty unusual at the time, a Tamron 70-220mm Adaptall zoom lens. This was one of the first zoom lenses to become popular with the ordinary photographer – previously there had been TV and movie zoom lenses – and I’d cut my photographic teeth using one of these on a college TV system a couple of years earlier – with a few fabulously expensive versions produced for 35mm. I’m not sure of the exact date, but it was around June 1974. 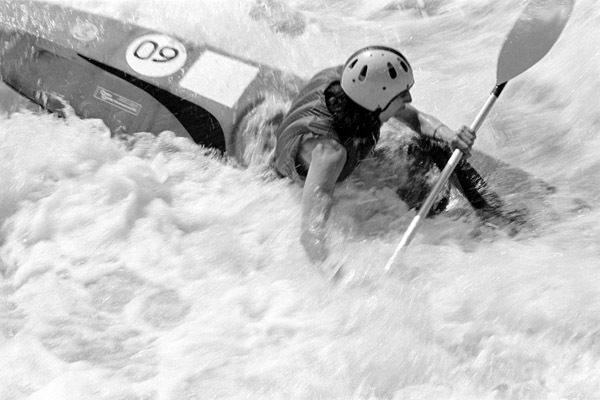 It was a rather important event in the world of canoe slalom, some kind of championship, but back then I was able to cycle up to the site were it was being held and walk onto the weir without any accreditation at all to take pictures. It wasn’t hard to find space to work, there were probably around a hundred people watching the event, mainly the other competitors and their friends and spouses. Things are very different at the Olympics or any other major event now. Then my only problem was being careful I didn’t fall in the water. A couple of years later I sold off the zoom and went back to using fixed focal lengths for the next 25 years or so. Zooms then were heavy and slow and not quite of the same optical quality of the fixed lenses. Now zooms have improved greatly and I seldom photograph with fixed focal lengths. When I do it’s because I need a macro lens (60mm) or a small and inconspicuous lens (20mm f2.8) or an extreme wide-angle (10.5mm semi-fisheye) rather than for a possible slight difference in quality, though perhasp that may change with the higher pixel density of the Nikon D800E. I photographed a few other sporting events around that time, including go-karting and got arm-twisted into photographing sports days at the school where I was then teaching. 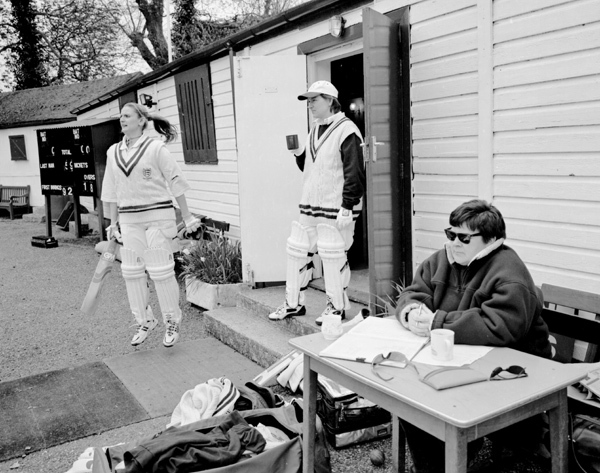 My next real sports photography came over 25 years later when I was commissioned to photograph the work of a local sports club, which was one of the best ladies cricket teams in the country and had a very strong training program with young girls. Mostly I wanted to photograph these training sessions, and the big problem then was lighting. I were still using film and the indoor sessions in a sports hall were impossibly gloomy without flash. Fortunately they moved outside as soon as it was light enough in the evenings, so I was able to work in an hour or so before it got too gloomy. 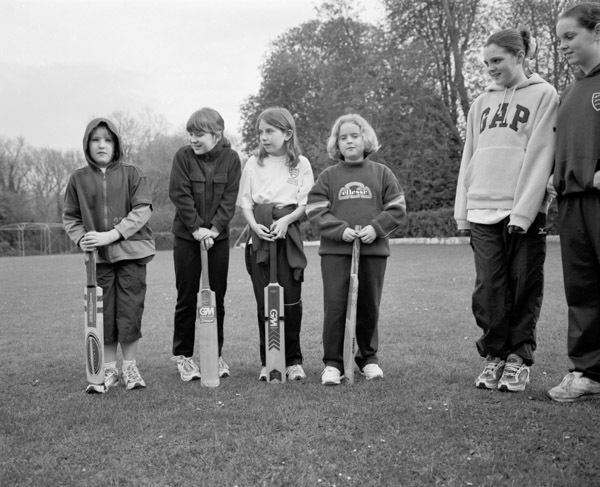 During training I could stand right up close, and most of the time the girls used a tennis ball and as long as I kept at least out of their reach with the bat I was reasonably safe, but they had to get used to using a proper cricket ball as well, when things got dangerous. With the actual ladies team they used a real ball all of the time, which wasn’t a great problem during fielding practice, but I had a few close shaves when they started batting, as they could really belt that ball as hard as any men. During the few actual matches I attended things were also safer as I had to keep off the pitch and my main problem was not having a long fast lens. I made do with a 200mm Zuiko f4 with a 2x converter on my Olympus OM4, but action images were pretty tricky, especially as the weather was fairly uniformly dull. But in any case I soon learnt that the most interesting things happened around the pavillion and off the pitch, where I was working with a Mamiya 7 and 65mm wideangle. The scans here from medium format film were made on an old flatbed scanner and I could make better now. But certainly the pictures away from the play show far more individuality than the action images – one person hitting a ball with a bat seems to look fairly like another to me, though I did my best to provide a few for them. Probably the most interesting part of the afternoon at these events were the teas, but they weren’t really what I was expected to photograph. This entry was posted on Friday, August 3rd, 2012 at 04:49 pm and is filed under My Own Work, Photo Issues. You can follow any responses to this entry through the RSS 2.0 feed. You can leave a response, or trackback from your own site.